Has Bitcoin Been Shot Down? Another week, another outrageous prediction for the price of Bitcoin. We just saw a forecast at more than 75 times the current value of the currency. The figure is $700,000. Is Bitcoin really about to take off to the Moon or has it been shot down? John Pfeffer, a partner at his London-based family office Pfeffer Capital, is not only betting on Bitcoin, but giving it a bold price target of $700,000—about 75 times the current Bitcoin price of nearly $9,500. But Pfeffer has even higher hopes for Bitcoin—that it could eventually be to central banks what traditional foreign reserve currencies are today. (From euros to Japanese yen, governments hold foreign cash to pay down international debts and complete other cross-border transactions.) “It’s imaginable that Bitcoin displaces some form of reserves over time,” Pfeffer said at the conference. Total foreign reserves are currently worth $12.7 trillion, he added. While it’s unlikely Bitcoin would fully replace all foreign reserve currency, Pfeffer also modeled scenarios in which Bitcoin would account for a quarter of foreign reserves, which would imply a 20x return from current prices. And if the total value of Bitcoin does rise to the equivalent of all foreign reserves, or $12.7 trillion—including both gold bullion and reserves combined—then that would mean a Bitcoin price of $700,000. “As an investor, what interests us most at this point is that Bitcoin might become the dominant non-sovereign currency,” said Pfeffer. Although he puts just 1% odds on Bitcoin actually hitting $700,000, the possibility alone is enough for him “to make a small, venture capital-style, buy-and-hold longterm bet on,” he said. Pfeffer also incorporates some more conservative targets for Bitcoin, for instance at $90,000, which doesn’t seem all that incredible given how Bitcoin has been trading in the past. Our main point here is that you can definitely view Bitcoin as a vehicle which could go up a lot – it has done so a couple of times already. At the same time, we wouldn’t bet heavily on it going to the Moon – we would rather view it as a private-equity-style investment, with very small positions potentially improving the overall portfolio. This is not investment advice, though. Each investor has different needs and constraints so there are no one-size-fits-all investment strategies here. Do we see any signs of Bitcoin taking off right now? Some commentators seem to believe this. We are skeptical, at least for the time being. Charts might explain why. On BitStamp, we actually do see one important change. It’s probably not what you would expect reading stories all over the Internet. 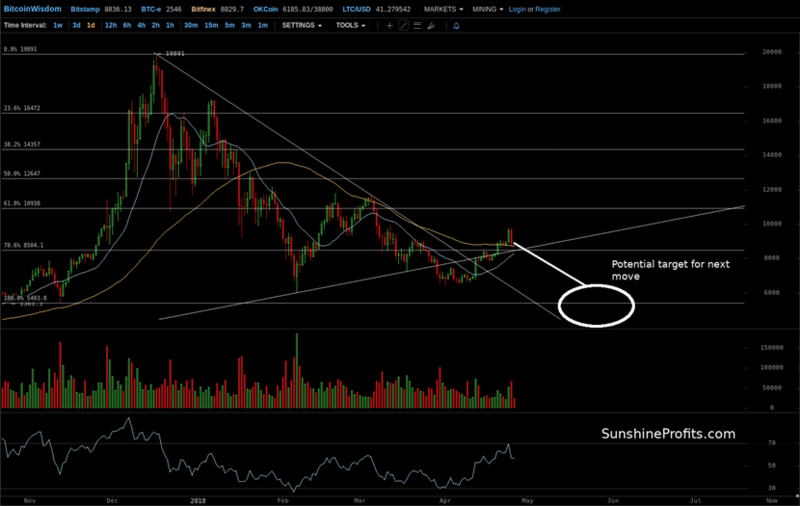 Namely, Bitcoin reversed course yesterday on elevated volume. This looks like a classic reversal pattern at first sight. But is it one? Our take is that it might be. The reversal more than erased the previous day of appreciation and the volume was visibly higher than on the day before yesterday. The depreciation also brought Bitcoin back to the level of the local top from back in the second half of March. This is a bearish indication. But there’s more than that. The potentially most important development is visible on the chart above. During the last bout of appreciation, Bitcoin went above the 38.2% Fibonacci retracement level which was a weak bullish development. The currency then completely denied this move going below the 38.2% level with a vengeance. So, we just saw a potential break above an important resistance, which was then promptly invalidated. This a relatively strong bearish development and it suggests that down is the direction in which the currency is still moving. On the long-term Bitfinex chart, we see the recent move up in perspective. Actually, the last two days of appreciation and immediate depreciation are visible on the chart as well and they look very much like a local top. Bitcoin came closer to the 78.6% Fibonacci retracement level and to the rising support line based on the previous local bottoms. This means that the pace of the move up has slowed down considerably and if we see a move down below this line than we could conclude that the move up was simply a corrective upswing. Even without this move down, the current situation is more bearish than a couple of days ago as we might have just seen a local top based on the price action and the increased volume during the decline. Another thing supporting a possible local top is the reading from the RSI indicator. We saw this indicator going to 70, which is the beginning of the overbought area. The fact that we saw a reversal just as the RSI got on the verge of an overbought reading suggests that we might have seen a local top indeed. This is not 100% certain, and we could still see a move higher but the situation looks more favorable for bears than it did a couple of days ago. The most important part from the long-term chart is the thing that didn’t change. 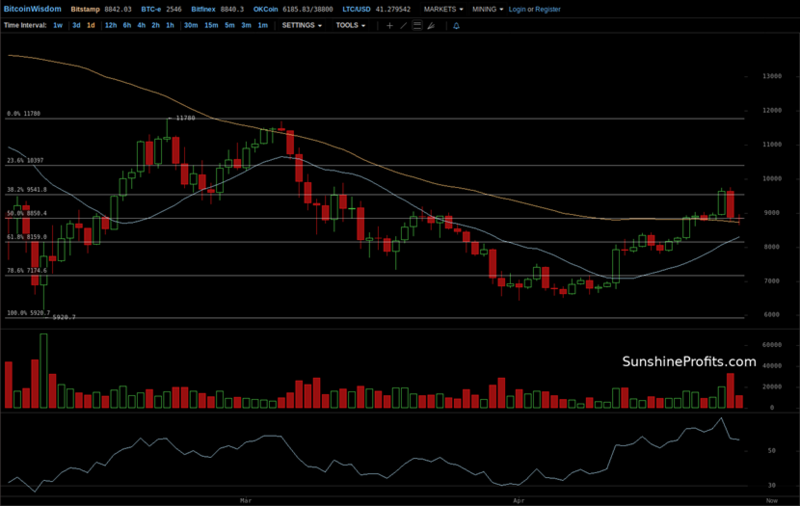 Bitcoin is still very far from the 61.8% retracement level, not to even mention the 38.2% retracement. We have potentially important resistance levels on the move up as well which suggests that even if we do see a move up, it might be limited in scope, for Bitcoin that is. Bitcoin has not been shot down but the current situation remains bearish. For the time being, it seems that the profits on our hypothetical positions might grow further. Summing up, Bitcoin moved up but reversed course on elevated volume, which suggests we might have just seen a local top. If we don’t see any action to the upside in the next couple of days, the chances of a serious decline will grow, in our opinion, and we would definitely want you to know that.